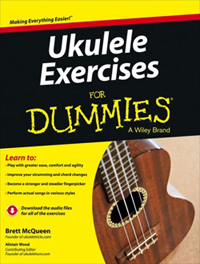 For the last month, you could get my new book Ukulele Exercises For Dummies in Europe and even the far reaching corners of the world, like Dubai, but you couldn’t get it here in the US – the US release date kept getting pushed back. As of today, May 6th, 2013, I have some very exciting news for my US friends. I’m very happy to announce that my new book Ukulele Exercises For Dummies is finally available in the US! If you are in the US, order the book at Amazon here. I’ve caught word from some US friends who pre-ordered the book that they are starting to receive their copies of the book in the mail. If you pre-ordered the book and haven’t received your copy yet, it’s on the way and I imagine you’ll be getting your copy in the mail very soon. I’ve learned that this book publishing thing can really keep you on your toes. Again, thank you for your patience with the delay. I know how anxious you’ve been, as have I. I sincerely hope you enjoy the book and hope it’s been worth the wait for you. Have you received your copy of the book yet? Where in the world are you located? Let me know in the comments area below! Got mine in Philadelphia. Looking forward to working through it. Excellent to hear. Hope you enjoy, Seth. I have had notification from Amazon.ca that Ukulele Exercise for Dummies should arrive at my Post Office May 17th – 28th, so it’s on its way. Looking forward to the book! This is great to hear. I’ve passed the word on to other Canadian inquirers. Thank you for the update! Hey Brett, Got my copy yesterday. AWESOME JOB MAN!!! Can tell that you put a lot of time, effort and thought into it. Now it’s just up to me to do the same learning it… lol. I purchased your book and wanted to download the audio files, but as a dummy could not figure out how?? Cool, Brett: I got the book two days ago but couldn’t open the page with the url given in the book: with your link it does work well! Excellent work: you rock! hey Brett! Thanks for the web site for the tracks that really helps.